SAILKARMA.COM - Sailing News, Videos and Photos! Sailboat racing as a stadium sport comes to San Diego Bay this week with the inaugural RC-44 championship regatta. The five-day event starts Wednesday and concludes next Sunday and will feature 11, high-performance RC-44 sloops. While most San Diegans have no idea what an RC-44 is and who is actually racing, although one of the favored boats is owned by Larry Ellison of Oracle America’s Cup fame, the regatta will give event the most land-locked among us a chance to see close-quarter sailboat racing. All the starts — and finishes — during the racing will be just off the end of the Broadway Pier. Depending on the direction of the wind and the day of the racing, the courses will take the boats up along the Embarcadero or toward Harbor Island. And rather than sailing away from the shore, the RC-44s will be racing on very short courses close to the bayfront. Wednesday’s match races, for example, will likely be contested on a half-mile course with pairs going off every five minutes. The twice-around windward-leeward races (that’s back-and-forth for rank novices) will last around 20 minutes. And race officials are hoping to get in as many as four rounds starting at 11:30 a.m. The program switches to fleet races Thursday through Sunday with each leg being 1 1/4 miles for a five-mile race. Officials expect the races to take 45 minutes apiece with hopes of getting in three to five rounds each day. The 11 boats entered will represent nine nations. For those more knowledgeable of sailing, the list of skippers reads like a Who’s Who. Among the world-class skippers entered are Russell Coutts, the hero of New Zealand’s America’s Cup victory off San Diego in 1995, Paul Cayard, Coronado native Rod Davis, Kevin Burnham and Morgan Larson. The series champion in 2010 was Oracle Racing featuring Ellison and Coutts. Prime viewing areas will be the tip of the Broadway Pier, the Embarcadero (for Wednesday’s match races) and Harbor Island (for the longer fleet races Thursday through Sunday). Perhaps the best viewing spot will be the flight deck of the Midway Museum. The viewing area will be free with a paid admission to the carrier museum. •Five Olympic class boats numbering San Diegans as either the skipper or crew have been included on the US Sailing Team for 2011. The team includes at least two boats in each Olympic class. The Star class has a pair of boats skippered by San Diegans Andrew Campbell (Ian Coleman crew) and George Szabo (Mark Strude). San Diego’s Graham Biehl is crewing for Stu McNay on the top-ranked U.S. Men’s 470 boat while the San Diego team of Adam Roberts and Nick Martin are ranked second. San Diego’s Molly Vandemoer joins Debbie Capozzi as the crew for top-ranked Anna Tunnicliffe in the Women’s Keelboat class. San Diego Yacht Club (SDYC) and Etchells Fleet 13, co-hosts of Etchells Worlds 2011, today reported that hometown icon Bill Hardesty, (Etchells World Champion, Chicago, 2008), is returning to his home yacht club of SDYC to begin a concerted campaign to win the 2011 Etchells World Championships, to be sailed in Hardesty’s home waters off San Diego. Hardesty’s entry brings to five the number of former world champions who have been participating in the local regattas for purposes of tuning up for the world title (Dennis Conner,Judd Smith, Vince Brun, Dirk Kneulman). Hardesty plans to have Point Loma High School sailing coach Steve Hunt on board for the worlds. Hunt recently finished 2nd out of 47 boats while sailing Line Honors, hull number 979, on loan from Hardesty. The Etchells is a fixed keel racing sloop which weighs 3250 pounds and is sailed by a weight limited crew of three or four. First designed in 1968 by world class boat designer Skip Etchells as a potential competitor in the Olympics, the Etchells class is known for its fiercely competitive yet close knit competitors. Despite beating the eventual Olympic selection, the Soling, the Etchells (then referred to as an Etchells 22 for its 22 foot long waterline), instead relied on grass roots growth and a strong commitment to its one design integrity. In addition to a timeless design and strong fleet organization, the Etchells class remains one of the few classes open to professional crew and weekend warriors alike. It remains a draw to the fleet that the weekend sailor can compete, and occasionally (and usually temporarily) prevail over sailing greats such as Dennis Conner, Gary Jobson, Ian Murray, Vince Brun, Judd Smith and Kenny Read. The 2011 Etchells World Championships will draw approximately 75 boats from 12 different countries, from as far away as the UAE, Hong Kong, New Zealand and Australia. Although the event commences with boat measurements on June 2-4, and racing on June 5, thereare several feeder regattas for which sixty boats will compete. The SLAM Etchells Midwinters will be April 8-10, and the Sailing Supply Orca Bowl - Pre-Worlds will be on May 21-22. With some teams already taking up part time residence, the Point Loma area is abuzz with Etchells sailors and added economic activity has been welcomed by the local businesses. For more informationgo to www.etchellsworlds2011.com or call San Diego Yacht Club 619.221.8400 http://sdyc.org. SAN DIEGO – The Oracle RC44 Cup San Diego, a world-class sailing regatta featuring the RC44 class fleet and sponsored by ORACLE, will take place on San Diego Bay, March 2 – 6, 2011. The regatta brings together the biggest names in international sailing and global business for the opening round of the 2011 RC44 Championship Tour. After the inaugural U.S. event in Miami at the end of the 2010 season, and an outing at KeyWest Race Week, the class is now heading west to make its debut at the Oracle RC44 Cup SanDiego. The event features 11 RC44 teams representing nine nations. The RC44 class was conceived and co-designed by four-time America’s Cup winner Russell Coutts. With an evenly split amateur and professional crew line-up, the class attracts some of the world’s leading business minds as their owner-drivers, along with many of the world’s top sailors. Racing will take place over five days in San Diego, with four days of fleet racing, where theboats can only be driven by their owner, and one day of America’s Cup-style match racing, when the pro sailors can get their chance to shine at the helm. Spectator viewing is free from portions of Broadway Pier, Harbor Island and numerous areas along the downtown waterfront. Among the top sailors set to compete on the 2011 RC44 Championship Tour are class designer Russell Coutts (NZL), American yachting legend Paul Cayard and San Diego native son Rod Davis, Audi MedCup winners Morgan Larson (USA) and Jose Maria Ponce (ESP), Olympic Gold medalist Kevin Burnham (USA), along with some of the world’s top match racing talent including Cameron Appleton (NZL). The 2011 RC44 Championship Tour takes in six venues, including in Austria, France, Sweden and Spain, before coming to a close with the 2011 RC44 World Championships in Lanzarote in the Canary Islands in November. 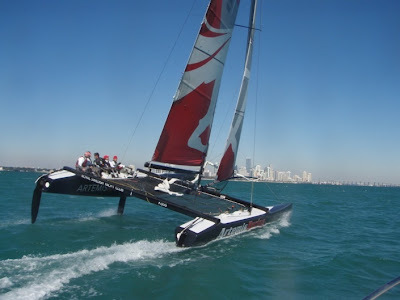 With Coutts’ ORACLE Racing team, led by Larry Ellison, winning the 2010 RC44Championship at a thrilling Miami showdown in December, each of the 2011 teams – established and new – will be vying to topple ORACLE from its throne. The Oracle RC44 Cup San Diego marks a poignant return to the city for Coutts, who won the first of his four historic America’s Cup titles in San Diego in 1995. He believes the 2011 RC44 Championship Tour is gearing up to be the most compelling and closely-fought yet. The Oracle RC44 Cup San Diego is organized by Sailing Events Association San Diego, a leading sailboat racing events organization, positioning the city as a top sailing destination by bringing world-class sailing events to San Diego. Racing will take place directly in front of the magnificent new spectator friendly Port Pavilion at the Broadway Pier, giving fans the chance to get close to the action. “All of San Diego is looking forward to great racing on San Diego Bay," said JJ Fetter, Olympic silver medalist and event coordinator for the Oracle RC44 Cup San Diego. "This will be a unique opportunity to see such high-caliber America’s Cup talent, like Russell Coutts, Paul Cayard and Rod Davis, return to do battle on San Diego Bay, and we will be encouraging the public to come and watch the action for free from the Broadway Pier." The RC44 Championship Tour was launched in 2007 and in its first four seasons visited multiple venues across Europe, the Middle East and the U.S.
World Champions and ocean racing record holders, will be squaring up against Olympians and America’s Cup hotshots, in the impressive roll call for the Extreme Sailing Series™ this year. The full crew line-ups are unveiled today ahead of the first Extreme Sailing Series™ Act to be hosted in Muscat, Sultanate of Oman in February (20th-24th, stadium days 22nd-24th). You can find the full crew line-ups in the TEAM section of the website and the 2011 EXTREME magazine is now available to browse online. Olympic and America’s Cup sailors dominate the teams this year - Terry Hutchinson (USA) Artemis Racing, Dean Barker (NZL) Team New Zealand, Roland Gaebler (GER) Team Extreme, Roman Hagara (AUT) Red Bull Extreme Sailing and Sidney Gavignet (FRA) Oman Air, are just some of the superstars for 2011 who will be raising the bar ever higher. Torvar Mirsky (AUS) The Wave, Muscat will inherit the ‘young-gun’ title from the skipper he is replacing, Paul Campbell-James. Campbell-James’ unabashed and aggressive style saw him grab the 2010 title from the more seasoned skippers and, no doubt, his new Luna Rossa team will be hoping for a repeat performance. At the other end of the age spectrum the experience is mind-blowing - Olympian Roman Hagara has attended the Olympic Games six times, winning two gold medals and Team Extreme skipper Roland Gaebler won bronze. 2008 Yachtsman of the Year Terry Hutchinson and his Artemis Racing team have between them competed in the America’s Cup an impressive 15 times. Groupe Edmond de Rothschild will return for their third Extreme 40 season having finished second overall for the past two years, but this time the all-French team will be headed up by Pierre Pennec replacing Yann Guichard who is now driving for Alinghi. Pennec, who represented his country at the Sydney Olympics in the Tornado Class, has been instrumental in the team’s success to date and is relishing the chance of leading the team. Guichard, having made the switch to Alinghi, is in good company under the leadership of Tanguy Cariou (previously with Franck Cammas’ Groupama 40) and seasoned mulithull sailors Nils Frei and Yves Detrey. On team Niceforyou an all-Italian line-up, skippered by Alberto Barovier, will use their combined America’s Cup experience to the max. Team GAC Pindar will return for a full season in 2011, at the helm match racing supremo Ian Williams who is stepping from one hull to two in his first Extreme 40 venture. This diverse range of competitive skills and experience is going to turn up the heat on the 2011 circuit making the outcome almost impossible to predict. Read the full Form Guide by DailySail editor James Boyd. Join us on Facebook and Twitter for the 2011 season. Find out the news first on Twitter. THE 2011 EXTREME MAGAZINE IS NOW AVAILABLE ONLINE... Find out more about the skippers and crews, read entertaining and insightful features by BBC Sport’s Rob Hodgetts, DailySail editor, James Boyd and YachtSponsorship.com guru, David Fuller. Packed with stunning photography and vital stats for the season ahead. To request a copy, please email media@extremesailingseries.com. OMEGA’s role as Official Timekeeper to the Extreme Sailing Series™ is confirmed for another season, making the Swiss watchmaker the longest-running official series partner since they came onboard at the inception of the circuit in 2007. OMEGA is proud of its nautical history and has an undeniable connection to the sea, being the only company ever to have produced a wristwatch that received marine chronometer certification. Its timepieces have long been the preferred choice of some of sailing’s greatest names. Last year, 2010 champion, Paul Campbell-James won the UK round at Cowes Week and was presented with an OMEGA Seamaster Planet Ocean watch. Find out more about Omega here. SLAM Shops and Point Loma Outfitting offers the latest in sailing and foul weather gear from the SLAM. The New 2011 US Super Yacht collection from SLAM is Italian designed and inspired by Yachtsmen from around the world. New in the SLAM Foul Weather Line is the addition of the BOR Spray Top. This spray top was tested and worn by top sailing competitors and major competition winners. 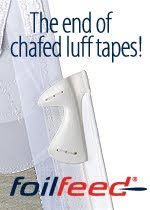 It is flexible, comfortable and best of all protects you from the environments. With its technical shakedown now complete, it is handover day for the new AC45 wing-sailed catamaran, marking the beginning of the next era of the America’s Cup. America’s Cup Race Management (ACRM) will now manage the logistics, care and maintenance of the prototype as competitors test the boat over the coming weeks. The AC45 is the forerunner to the larger AC72, which will be used in the 34thAmerica’s Cup. A traditional Maori blessing will start the day as competitors, prospective competitors and New Zealand dignitaries converge to see the latest in America’s Cup technology and celebrate the tireless effort of the New Zealand marine industry to make this occasion possible. 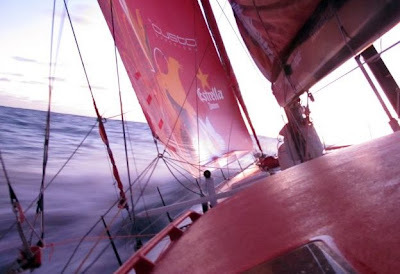 Of the 19 teams so far entered in the double-handed, Class40, Global Ocean Race 2011-12 (GOR), the campaign of the Franco-British duo, Halvard Mabire and Miranda Merron, is one of the most ambitious. In late September last year, the Finot-Conq Design Pogo 40S² hull #101 – the fifth, new generation Pogo - left Christian Bouroullec’s Structures Chantier Naval yard in Brittany and was transported 330 miles on a low-loader to Mabire and Merron’s boatyard-base in Barneville, Normandy. Since the yacht’s arrival, work has rarely ceased in the duo’s immaculate boatshed. One of the first, major tasks, undertaken in mid-November, was installing the Lombardini engine: although slightly heavier and more compact than a French, back-row, international rugby player, Mabire compared this complex operation with manoeuvring the inert form of Sébastien Chabal through the companionway hatch and into the bilge. Once the L’homme des Cavernes (Caveman) was bolted in place, the duo focused on the ballast system: “The ballast tanks were built and fitted at Structures,” explains Mabire. “But we had to design and fit the plumbing, scoops and pump.” Recently, the duo has been concentrating on the deck layout: “It’s complicated to design a really efficient deck plan that suits us both,” he continues. While Mabire’s professional background has been divided between racing and boatbuilding, the shed-environment is relatively new territory for Miranda Merron. “Halvard’s the expert here and I’m the apprentice,” she admits. “But I am learning many of the essential skills and can complete a number of the jobs myself,” Merron continues. “Right now we’re building the mainsheet track support.” However, Mabire is fully involved with the design process and this vital element eats into each day: “There really aren’t enough hours in a day to complete manual work on the boat and spend time developing the drawings for the mast, keel and so on,” says Mabire. 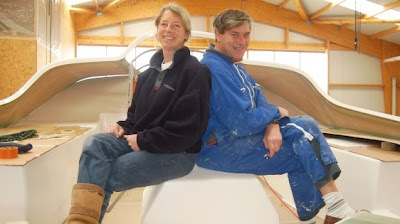 The boat’s mast is currently under construction at Eric Duchemin and Philippe Boclet’s Axxon Composites facility in Romania, but this has barely reduced the workload: “It’s seven, long days a week, pretty much every week, just working on the boat and the project,” adds Merron. St. Maarten, N.A. (February 2, 2011) – With less than a month to go before the kick-off of the 31st St. Maarten Heineken Regatta, which this year runs from March 3-6, the entry list continues to grow at a rapid pace, and now surpasses over a hundred yachts (the “century mark”) competing in a half-dozen different classes. The numbers are also growing for the Gill Commodore’s Cup, the separate one-day event for hard-core racers that precedes the three-day St. Maarten Heineken Regatta. At the latest count, the Gill fleet rounded out at an even twenty boats. As always, the more laid-back bareboat class is historically one of the largest divisions at the St. Maarten Heineken Regatta, and it appears that trend will continue for 2011. With nearly four-dozen entries thus far, the “bareboaters” will once again be in the thick of the action. With over fifty entries to date, however, the lion’s share of entries will be racing in the CSA Monohull classes, and it’s a truly international field, with competitors flying home flags from France, Germany, Great Britain, Holland, Italy, Puerto Rico, South Africa, Turkey, the United States, and a host of Caribbean nations. While the sailors themselves represent a wide and varied background, the respective yachts also form a diverse and eclectic fleet. At the smaller end of the spectrum are the Melges 24, Budget Marine/Gill, as well as a host of boats in the 30- to 35-foot range, including Tanner Jones’s J/30, Blue Peter; the Beneteau First 310, Americano Café; a pair of swift Melges 32s, David West’s Jurakan and Mark Plaxton’s Team INTAC; Todd Mahoney’s Sigma 33, Overtime; Schrijverke, a Victoire 34; No Face to Face, a J/105; and the radical Kiwi 35, Wild Devil. On the other end of the scale, Sir Peter Harrison’s sensational Farr 115, Sojana, a perennial favorite at the St. Maarten Heineken Regatta, will once again be soaring around the racecourse. But Sir Peter will have plenty of company in the big-boat divisions in a fleet that includes another big Farr design, Peter Buckley’s 98-foot I-Sea; a Swan 100, Varsovie; a Swan 82 and 80, Nikata and Team Selene, respectively; a Carbon 82, Aegir II; and Bella PITA, a custom 75-footer designed by Bill Tripp. In the middle ranges of the St. Maarten Heineken Regatta field, Bill Alcott’s Swan 601, Aquarius, is always a dangerous presence. Puerto Rican Sergio Sagramoso, who was often a dominant competitor in his old Beneteau First 40.7, Lazy Dog, will be no less of a threat in the Grand Soleil 54 of the same name that he now campaigns. The popular 40.7 is still a favorite Caribbean racer/cruiser, and four have entered thus far: Coyote 2, Mystery, Smile and Wave, and Spirit of Venus. In fact, some of the hottest action on the racecourse will take place among the 40-footers, which also include Rich Wesslund’s well-sailed J/120, El Ocaso; Wild T’ing, Lawrence Aqui’s Dufour 40; Lenjohn Van der Wel’s Class 40 flyer, Van Der Wel Racing; and Otra Vez, a J/122 skippered by William Coates. The “sleeper” in this competitive group, however, may well be Bob Read’s J/40, Nepenthe. The veteran New England sailor knows a thing or two about yacht racing, and is also the father of a couple of pretty good racers: sons Brad and Ken, both multiple World Champions in the J/24 class, and the latter a former America’s Cup skipper who now heads up the Puma Volvo Ocean Race campaign. All in all, it’s shaping up to be another stellar year for the St. Maarten Heineken Regatta. And there’s still plenty of time to make sure you’re part of it. For full information on the Budget Marine Match Racing Cup, Gill Commodore’s Cup and the St. Maarten Heineken Regatta, as well as entry lists, past results, photos, videos, party and band information, the Notice of Race, Sailing Instructions and much, much more, visit www.heinekenregatta.com.